The Watershed One blog begins as we initiate site work, but in fact we built the Vierendeel trusses and the roof a month ago. I’ll share those photos and the stories that go along with them later in the process. For now, let’s start at the beginning: survey stakes pounded into the rocky, thirty- degree slope and a five-foot toothed bucket on an XD 330 excavator. The first step was removing the thin layer of organic soil that overlaid the bedrock. We had to get this out of the way so we could access the clean rock and then process it into our backfill and other building products. On the north slope the soil was only 12” deep, but as we swung east into the bowl we encountered a deep alluvium built up over millenia. We piled up roughly 400 cubic yards of topsoil and transported it 2.5 miles to our storage yard. Total elapsed time to remove the topsoil from the site to the yard: 12 hours one excavator and eight hours two end dumps. With the site buffed, we began the bench cuts for the two masonry volumes. Each cut was roughly 1000 square feet with an average depth of four feet. 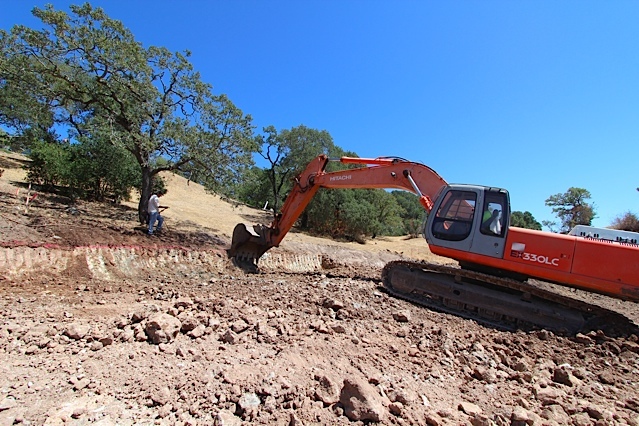 As the excavation increased in depth, the rock became harder, so we brought in a second excavator mounted with an impact hammer. The two cuts took 12 hours and left us with a mountain of roughly 600 cubic yards of fractured rock. Next step was processing the mountain of rock into usable sizes. We first ran all of the rock through a four inch vibrating screen to get two piles: one all the rock bigger than 4” and the other everything from 4” in size down to small pulverized grains. We then re-screened the 4” pile down to 1-1/2” and smaller. The end result: 300 yards of 1-1/2” minus (premium backfill and rammed earth), 150 yards of cobbles ranging in size from 1-1/2” to 4”, and 100 tons of fractured wall building rock. At a landscape supply yard topsoil would sell for $40 per yard, the premium backfill for $30 per yard, the cobbles for $70 per yard, and the building rock for $100 per ton. All totaled we obtained a range of materials with a market value $40,000 (400 x 30; 300 x 30; 150 x 60; 100 x 100). Costs for the excavator, rock hammer, trucks, and screening plant roughly $25,000. We plan to use all of the cobbles, 50% of the premium backfill, 25% of the topsoil and 10% of the fractured wall rock during the construction of the Watershed One house itself. The remaining premium backfill we will use to build rammed earth blocks at the factory, and the topsoil and fractured rock we’ll sell to local landscapers. The lesson here is that careful planning and wise resource use can reverse our thinking about site preparation and the cost of off-haul.